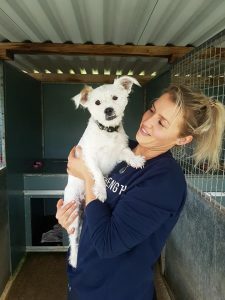 K9 CRUSADERS would like to say a WHOPPING thankyou to long time supporter and adopter Jodie Morris, her support team and everyone who sponsored her recent sea swim. Jodie raised £448 for our dogs! When she called in yesterday we had a job to separate her from new arrival Sparky. Well he does have that ‘certain something’, doesn’t he?